This quality chefs style apron is made from 65% cotton and 35% polyester and is fully machine washable with similar colours. This quality chefs style apron is made from 65% cotton and 35% polyester and is fully machine washable with similar colours. Recommended to air dry and iron on a medium low setting if desired. Loop neck strap with and adjustable waist ties makes an easy fit for most adults. 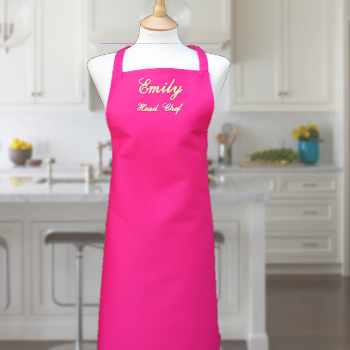 Adult apron measures 72cm width by 86cm length. Personalised with an embroidered name, initials or brief message in your choice of thread colour and letter font style.